Henrik said and followed up with, “Can you make me a thousand?” Henrik is my number one fan! So, here is my t-shirt project. 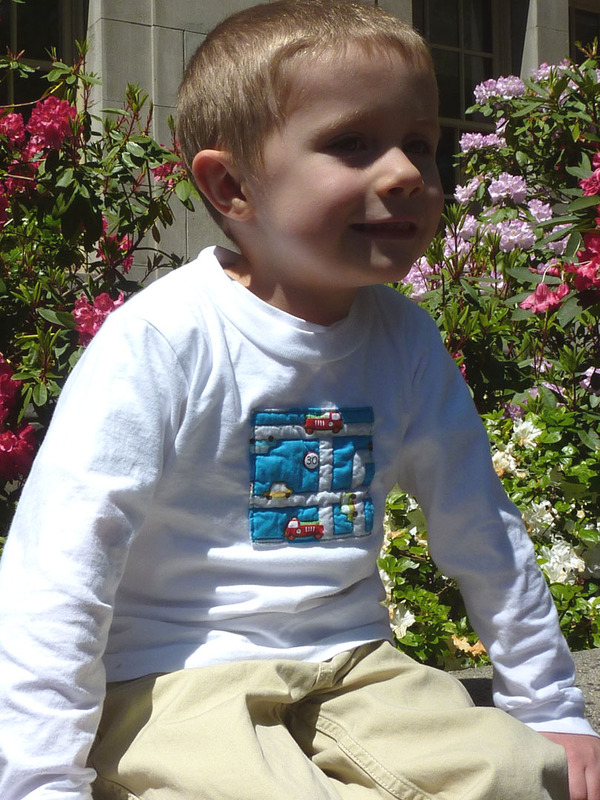 I have now made four shirts in Henrik sized demos. He is thrilled with all of them. This car one is was the second one I made. These photos were taken in front of the library. We went to see the movie Ingredients at the Central Library today. Henrik made it almost all the way through the movie. There was lots of footage of animals and tractors so he was entertained. The adults in the family enjoyed the movie. There was a lot of attention paid to the Portland Farmers Market and local restaurants using local ingredients. I really loved all the images of beautiful food, both raw and cooked. 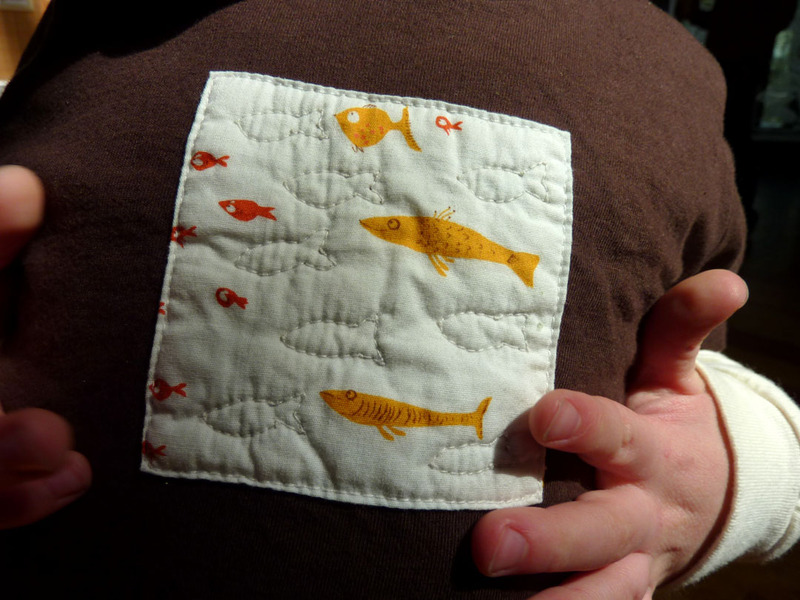 This fish print was the first shirt I made and it served as my trial run. It was my chance to get the ideas that have been swimming around in my head out on fabric. I like the way it turned out, but I have now graduated to slightly larger quilt blocks. I plan to increase the size of this block when I make them to sell. 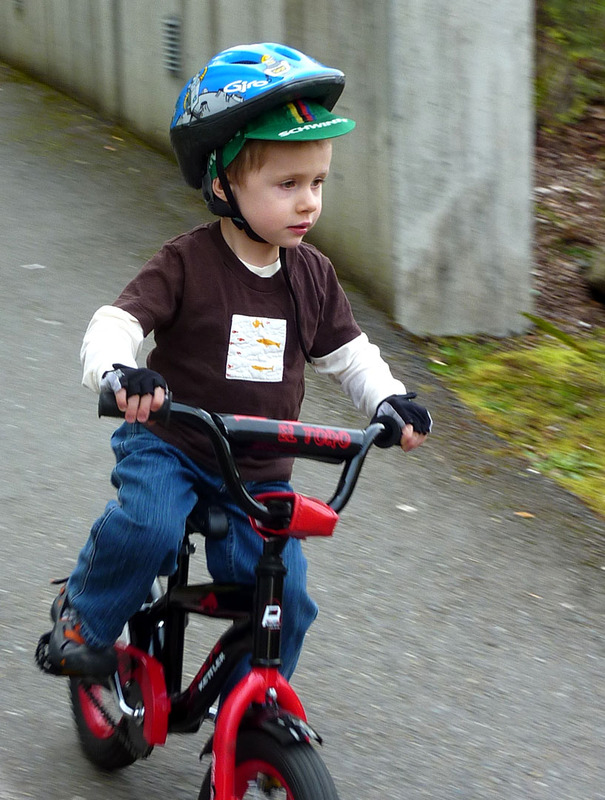 These photos were taken on our recent trip to Evergreen. I loved these ladybugs from the minute I saw them. I plan on using them for the trim on a pair of Oliver + S Sandbox Pants. This shirt was an experiment as I created it. I first thought that I would just stitch a few of the boxes. 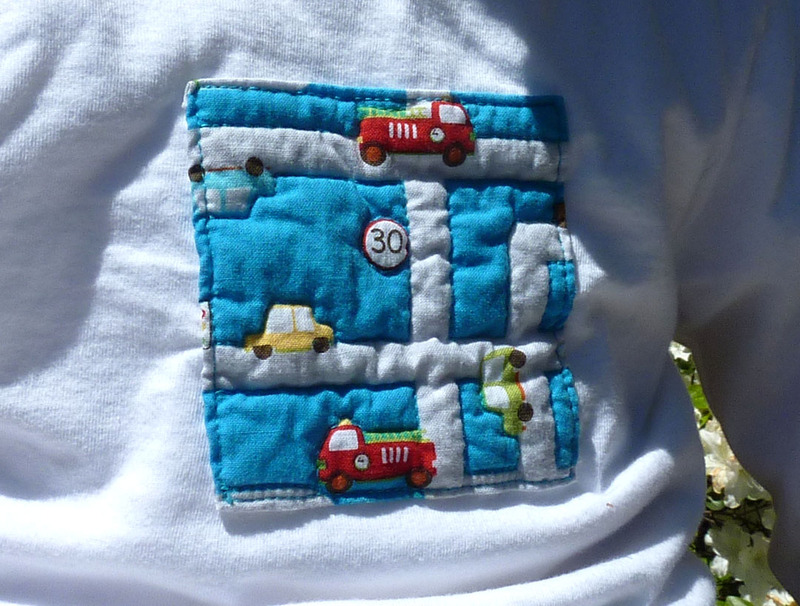 Then I stitched a few more. Then I ended up stitching all of the lines. 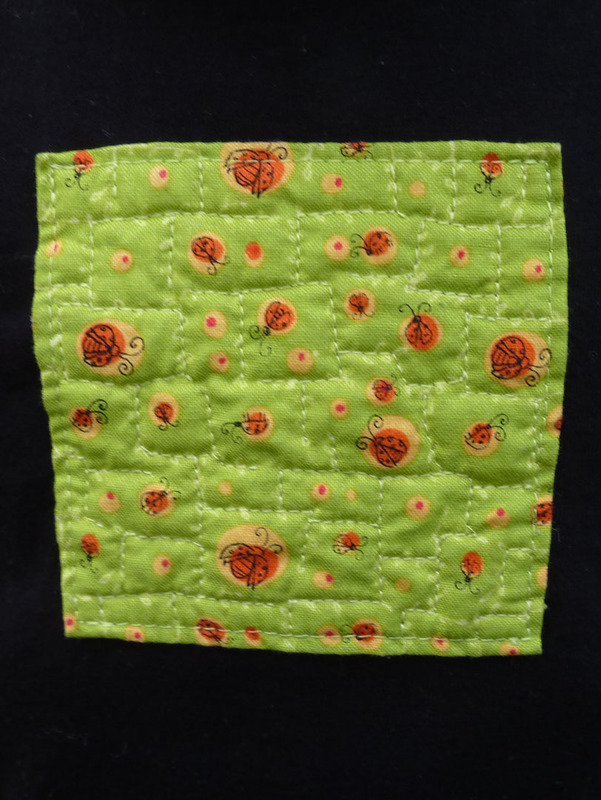 I love the texture created by the detailed stitching and the contrast of the green with the black. I just made this shirt this weekend. I have refined my stitching and finishing techniques with each shirt so far. Each one has its own challenges, but I am enjoying the process. The batting really helps these guitars to pop off the shirt. This quilt block has the most depth thus far. Henrik will be starting ukulele classes in September. 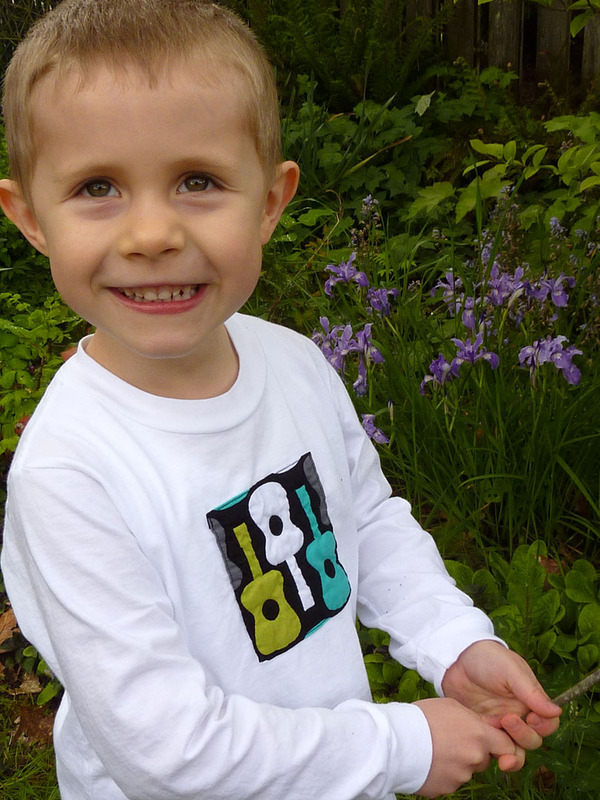 He is looking forward to rocking out in this t-shirt. I am getting closer to birthing this business baby that has been gestating for way too long. Mother’s Day gave me the opportunity to sew a little, enjoy some family time and make a great dinner. 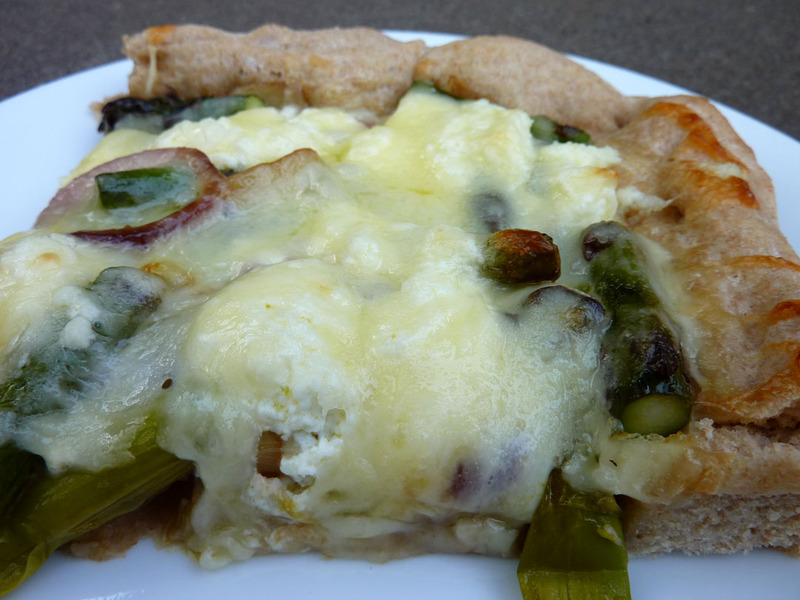 We had Asparagus Pizza. I have been using a pizza dough recipe from How to Cook Everything Vegetarian by Mark Bittman. I used 1C Fairhaven Bread Flour and 2C Fairhaven All Purpose. I sautéed the asparagus with olive oil and whole garlic cloves. I added the red onion rounds for just a few minutes at the very end. I shaped the dough on the sheet, added the asparagus mix, dolloped some ricotta around, sprinkled the grated mozzarella and provolone on top and baked. Oh, and we ate it up. We finished dinner with this great Lemon Poppy Seed Pound Cake. Yum, yum! 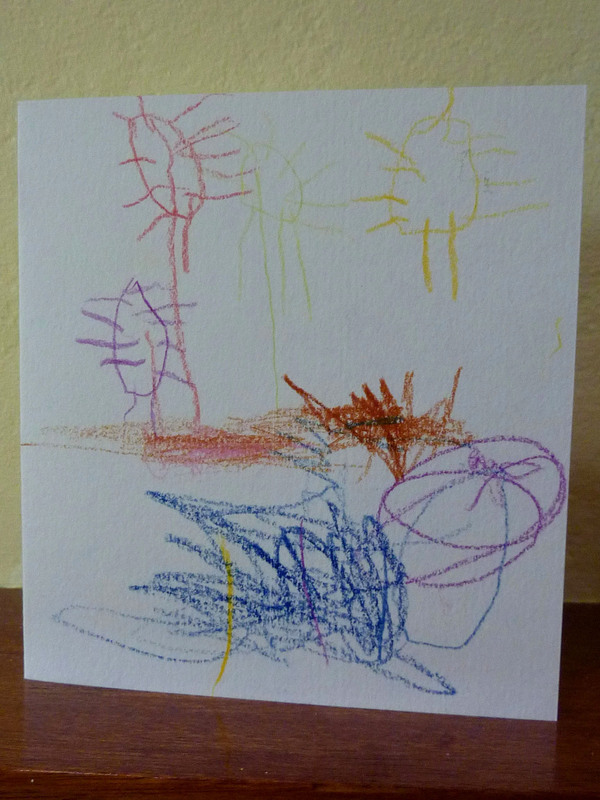 Henrik made me a beautiful Mother’s Day card. There are flowers and the sun. The brown on the right is dirt and the lighter brown on the left is a nightcrawler. The blue is our kitchen and the purple is a painting. Henrik has an imagination on par with Ramona. Hope you enjoyed your day too. Happy Mother’s Day! 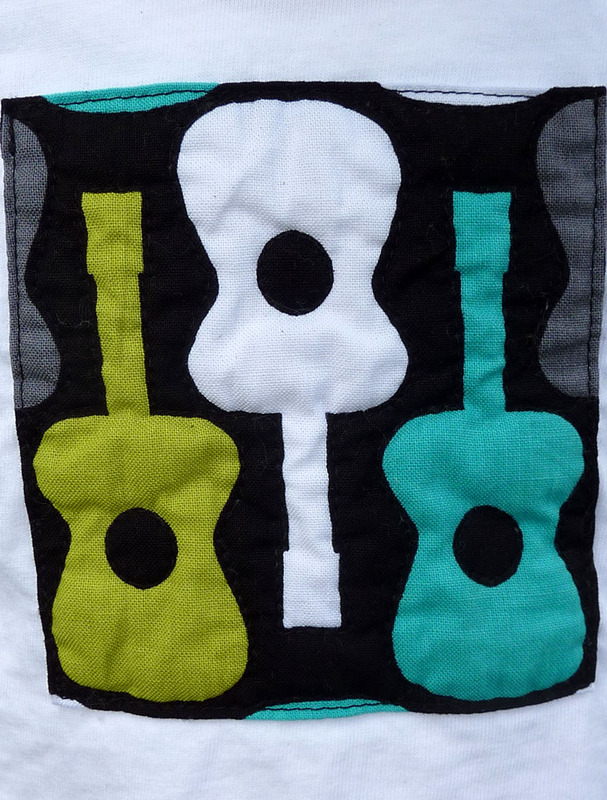 This entry was posted in Beauty, Create, Eat, Family, Food, Food Security, Local, Quilt, Quilt Block Tees, Recipies, Watch. Bookmark the permalink. 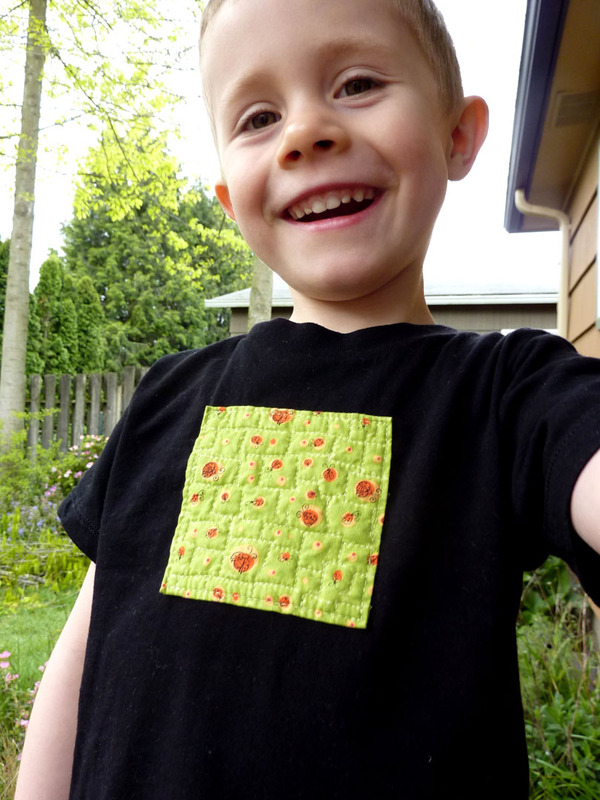 This entry was posted in Beauty, Create, Eat, Family, Food, Food Security, Local, Quilt, Quilt Block Tees, Recipies, Uncategorized, Watch. Bookmark the permalink.